View the full 2018 Show-Me 100 results below. Cliff Morrow, Bryon Allison, JC Wyman, Billy Moyer JR and Joseph Gorby have all scratched ahead of the final night at Lucas Oil Speedway. 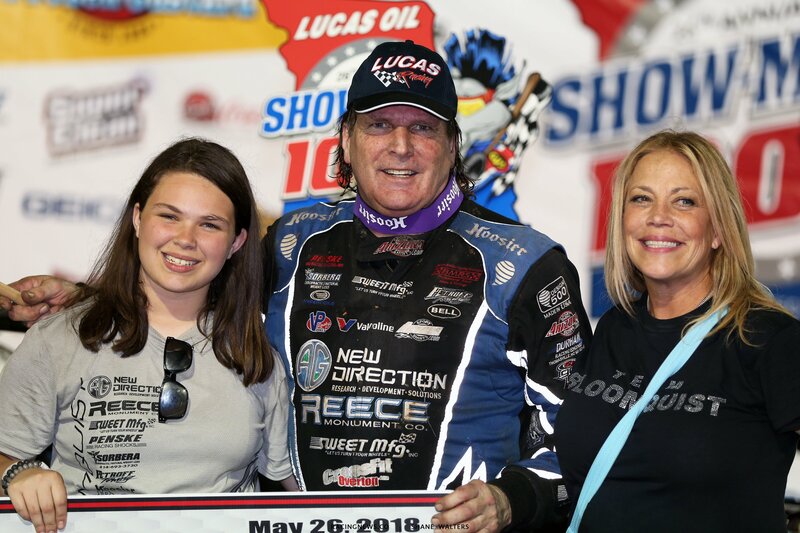 Scott Bloomquist has never won the Show-Me 100 at Lucas Oil Speedway. He’s won the event, 4 times. He just hasn’t done it since the race moved to Lucas Oil Speedway. Tonight, he’ll start from the pole in a car that he calls the best one he’s ever had here. Jesse Stovall and Will Vaught line up on row one for the first LCQ of the night. Green, Stovall runs a little wide into turn 1. Satterlee is on the gas around the top. Stovall slides into the nose of Satterlee, the #22 goes around. Complete restart. Green, Vaught wins the race off turn 2. Stovall and Satterlee both head for the bottom in turn 3. Stovall pulls even with the leader but Vaught carries the momentum around the top to hold the lead. Lap 6, Stovall has another run. He cuts to to the bottom again in turn 3. Stovall nearly clears him but Vaught powers by again on the outside lane. Lap 10, John Duty is around in turn 1. He heads for the pit area. Green, Satterlee gets the jump on the outside! They bang fenders into turn 1. Gavin Landers is sideways in turn 3, Roth slides across his boss. Landers is off on the hook. The lap was complete, Satterlee leads. Green, Satterlee leads by 3 car lengths into turn 1. Two to go, Stovall is around Vaught for the final transfer spot! Up the road, Satterlee cruises to the win. Jimmy Mars and Earl Pearson Jr trail the pace truck ahead of B main number two. Green flag, Pearson leads into and out of turn 1. Shannon Babb is up to 2nd, he rolled by Mars on the outside. Trouble at the back. Several cars are around in turn 1 on lap 2. Green, Pearson kicks it to the top in turn 1. Shannon Babb trails in his tracks. Lap 6, slow car on the track. The caution is out. Green, Pearson and Babb check out on the field. They’ll both transfer into the main event. 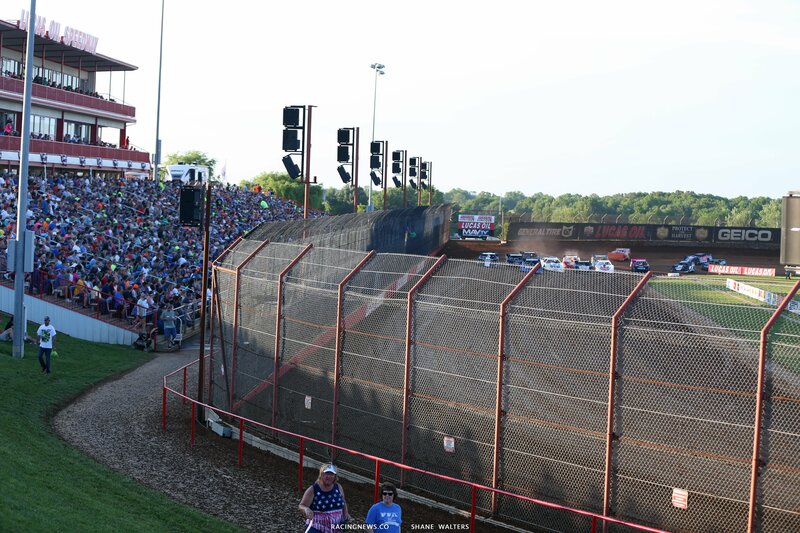 The Rocket camp, Brandon Sheppard and Josh Richards will lead the field to the green in the final B main if the night. Green, they head side by side into turn 1. Richards swings to the lead on the outside of turn 2. Spinner in turn 3, multiple cars collected, the caution is out. Green, same thing. This time Richards gets a better launch. He leads by a nose on the high side of turn 1. Spinner, the caution is out. Green, another spin and another caution. 10 to go, the green flag is out. Richards launches through the bumps in turn 3. Mason Oberkramer challenges Sheppard for 2nd. They bangs doors off turn 2 and Oberkramer gets sideways. Oberkramer is sideways down the straight, he collects it but loses a position. Spinner, caution. Green, Richards is gone. Oberkramer slides Sheppard in turn 4. Sheppard has to jump on the brakes as Oberkramer slides across the nose. They stack up behind them as an unrelated car stalls and Tyler Erb jumps over a car as they form a road block. Green, Sheppard loses another position. Tyler Erb is around in turn 4, caution. Green, Richards hits a bump in turn 3, his car jumps up the hill. He holds onto the lead. Richards drives to the win and Oberkramer takes the final transfer spot. Only the winner will transfer into tonight’s main event. Jake Davis and Jimmy Mars will lead the field to the green flag. Green, Davis gets the jump he leads by a car length into turn 1. Davis is on the brakes hard through the middle. Mars jumps to the cushion on the outside. Mars powers by on the outside as they split Davis off turn 2. Lap 7, Mars is gone. Spin in turn 3, caution. Green, Logan Martin dives to the inside in turn 1. He’s nearly clear but Mars holds the position on the high side of the track. Martin slows in turn 3. The caution is out. Green, Chase Junghans attempts the slider in turn 3. He doesn’t clear him. The red is out as Matt Furman collects the wall in turn 3. Lap 15, 7 cars remain with 5 laps to go in the LCQ. 24 cars started the race. Jimmy Mars takes the win. He had the choice to take the $2,500 or start dead last in the Show-Me 100. Mars has elected to start from the tail. 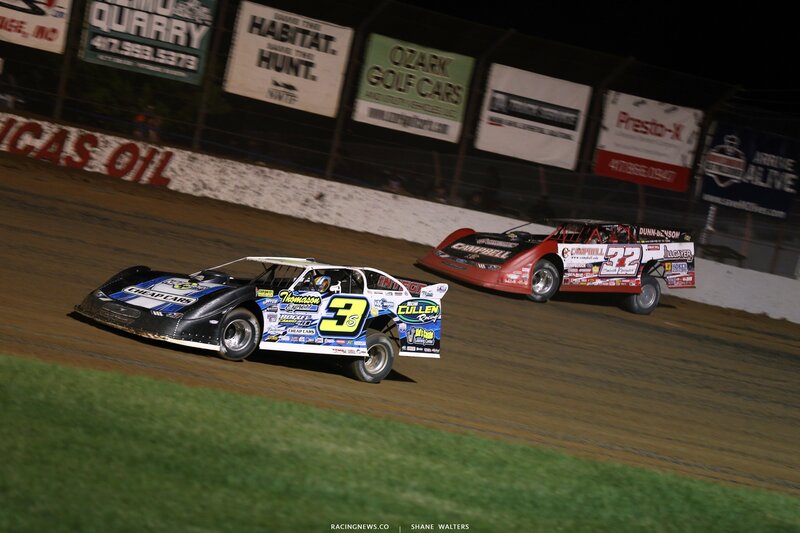 Both Clint Bowyer Racing machines will be gifted a Lucas Oil Late Model Dirt Series provisional. Don O’Neal and Darrell Lanigan will both start at the tail. Tony Jackson Jr and Will Vaught are the recipients of the MLRA provisionals. There’s a mad scramble in the pit area of the Jesse Stovall machine. He claimed a transfer spot through the B Main. However, several crews are currently working to swap out the engine. Jimmy Owens was 3 tenths quicker than the field in A main hot laps. 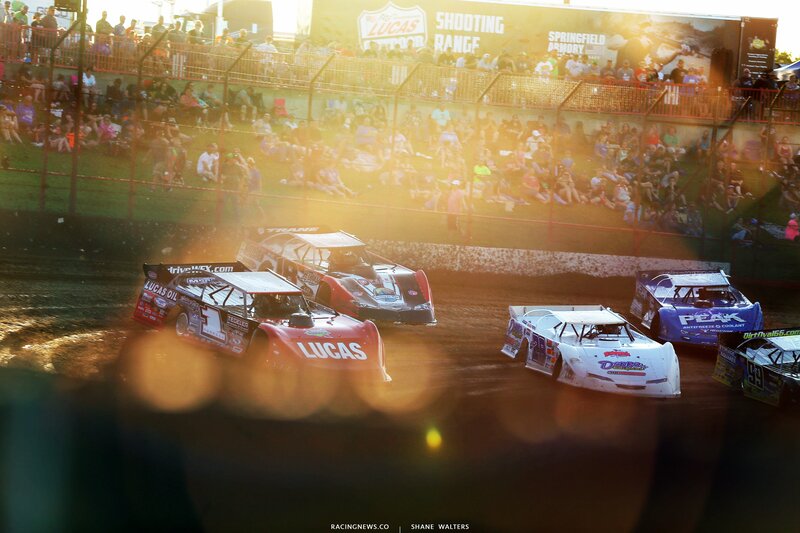 It’s a 100 lap main event at Lucas Oil Speedway. The winner is set to head home with a check for $30,000. The four wide salute is rolling and we’re ready to go racing. 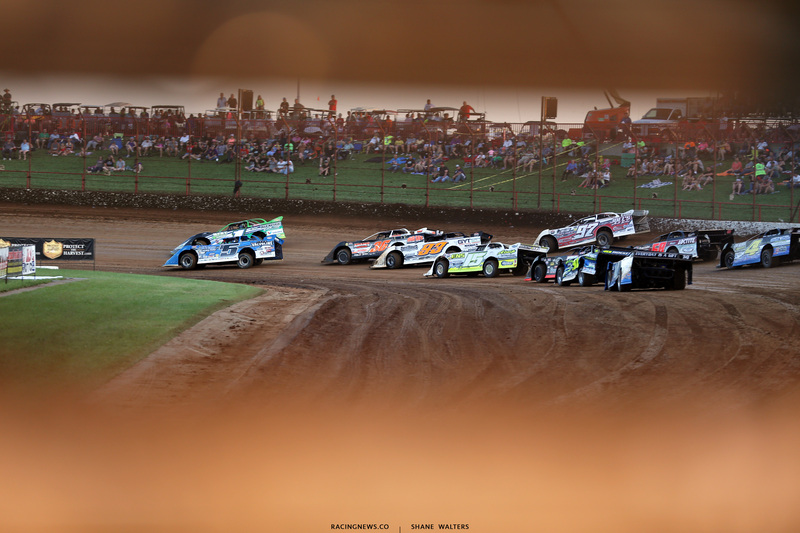 Green, Bloomquist and Owens race side by side through turn 1. Owens noses ahead off turn 2. Bloomquist fights back in turn 3. Owens pulls away off turn 4. Lap 6, Bloomquist runs back down. Bloomquist cuts to the bottom in turn 1. Owens holds the position off turn 2. Jimmy Owens drops to the bottom lane. Bloomquist will need a new lane. Lap 13, the leaders race through lap traffic. Owens moves high to have a look around the lappers. Owens hits a bump in turn 3, he washes up the hill and Bloomquist looks to the inside. Bloomquist to the lead! Lap 22, now Bloomquist runs the middle to work around lappers. Owens dives to the bottom in turn 3. He completes the pass in turn 1. Owens back to the top of the board. Lap 24, Mason Zeigler is slow on the front stretch. The caution is out. Green, Owens leads. Jared Landers started 14th. He’s up to 6th. Lap 35, Owens leads by 1.5 seconds over Bloomquist. Lap 45, Jared Landers is around in turn 4! The caution is out. Billy Moyer hits the pits and returns. Green, Owens leads. Stovall and Moyer exit the track under green. Lap 68, McCreadie is up to 6th from 13th. Lap 69, big trouble for the leader in turn 4! Owens is around! He was attempting to lap Earl Pearson Jr. Owens was sideways under him but Pearson swung back by on the high side. As Owens rear end was kicked out to avoid contact, their spoilers touched and Pearson pulled him around as he went back by. Freak accident if I’ve ever seen one. No damage for Owens but he’s going to the tail. 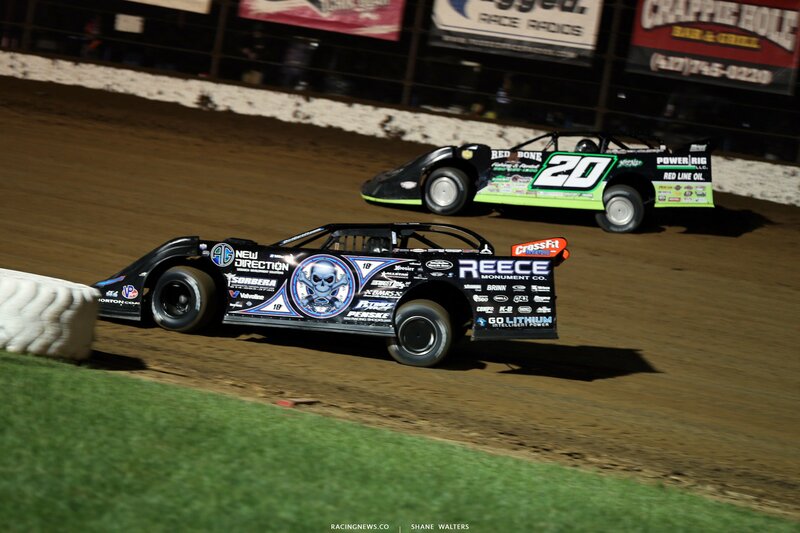 Bloomquist inherits the lead. Lap 78, bigger problems for Owens. He was back up to 16th. However, he jumped the cushion in turn 3, the rear snacked the wall. That whipped the front end around and he hit the wall with the front. Owens pulls it directly to the pit lane. Green, Pierce and Shirley swap 2nd. They swap once more. Lap 81, Landers slows down the front, caution. Green, Pierce has found speed at the edge of the race track. He drives around Shirley and pulls to the rear bumper of Bloomquist. Pierce fades, Bloomquist drives away and Shirley is back around Pierce. Shannon Babb pulls off the track under green. Lap 90, Bloomquist leads by 10 car lengths. 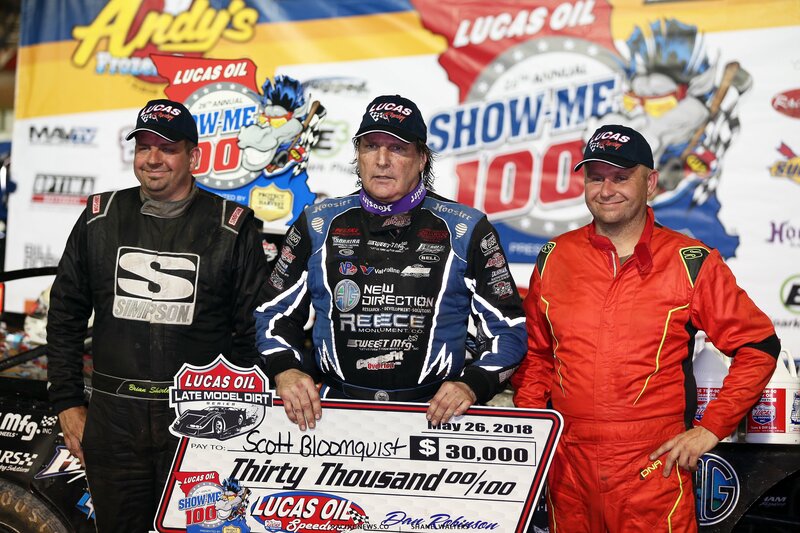 Bloomquist wins the Show-Me 100 at Lucas Oil Speedway! Next weekends event at LaSalle Speedway has been canceled. 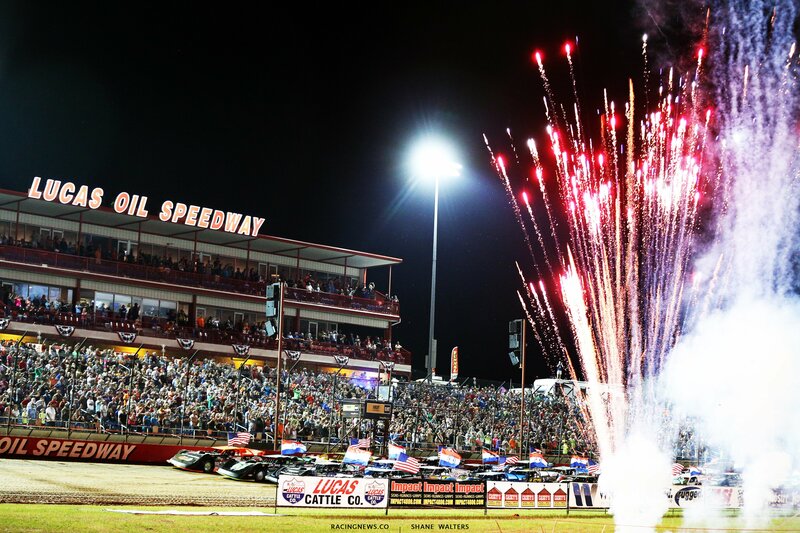 The next stop for the Lucas Oil Late Model Dirt Series is the Clash at the Mag. That race will run June 14-16 at Magnolia Motor Speedway in Columbus, MS.
View full Lucas Oil Speedway results below.